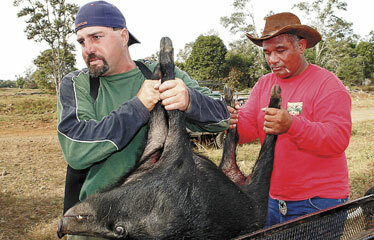 Near Kealakekua, Hawaii, Roland Tavares, left, and Hano Grace take a pig shot by Grace over to a large cooler used as a table to dress the game and store the meat. HILO » A Hawaii County councilman has prepared a resolution calling for more than a tenfold increase in the number of feral pig traps to deal with the growing number of pigs rummaging through people's gardens and farms. Councilman Dominic Yagong's proposal would allocate $100,000 for boosting government pig traps on the Big Island to 200 from 15. Currently, all the government pig traps on the island are set by the state Department of Land and Natural Resources. Yagong, of Hamakua, said wild pigs can destroy gardens, crops and yards while they forage for food. He said constituents have come to him with complaints about wild pigs destroying their properties. Yagong said the state is doing a "great job" with helping to eradicate wild pigs, "but it's only 15 traps." He said the county did something similar in the past when it joined forces with the state and federal governments to control and eradicate coqui frogs, considered a nuisance mainly for the noise they make. "People don't care if it's the state or county helping them," he said. "All they want is their governments to help deal with the problems." The county has in the past considered other ways of eradicating pigs, including dispatching hunters with guns and dogs to residential areas. But the county concluded "the liability for something like that is much too high," Yagong said. Some residents erect fences in an effort to stop the pigs from entering their yards and farms, "but that just sends them down to the next property," he said. Yagong attributes the increase in pig problems to more development, which has pushed the animals out of their environments and into residential areas. The proposed resolution also calls for a plan to distribute the captured pigs to county families for food. Yagong plans to present the resolution at an upcoming Council committee meeting. Other Hawaiian islands have also grappled with wild pigs, which are not native to the islands, but have descended from domestic pigs. After receiving reports of pigs marauding through Oahu's upper Manoa Valley, state officials discussed last year conducting day hunts in the area with dogs and archers. They also proposed full-moon hunts once a month, trap-building workshops for residents and distribution of a pig hunter contact list.